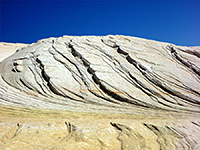 Along the unpaved Cottonwood Canyon Road in the west central region of Grand Staircase-Escalante National Monument, Yellow Rock is a low, smooth sided dome of swirling, multicolored Navajo sandstone, completely without any covering vegetation, and high enough to overlook many square miles of the surroundings. 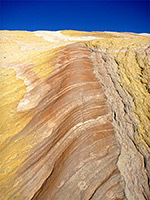 The far-reaching views are one attraction, but the main reason to visit is the amazing diversity of colors and textures; yellow is the main hue, but the sandstone is crossed by straight or wavy bands of many shades of red, pink and white, which combine with the thin-layered surface ridges to create a great variety of patterns. The rock has been known to locals for some time but has become a relatively popular destination since appearing in Michael Kelsey's Paria River book in 2004, and is typically visited by one or two dozen people each day in summer. The summit of Yellow Rock lies close to the road and is reached by a short cairned route that climbs the west side of Cottonwood Canyon then crosses the slickrock slopes beyond. Besides the rock itself, the surroundings also have interesting features including jagged, heavily eroded pinnacles and elegant wave-like formations so although the rock can be seen in little more than one hour, a full day could be spent exploring. 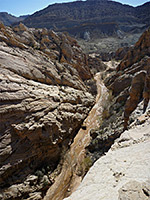 Other sites nearby include deep narrows along the lower end of Hackberry Canyon just to the north, and the Paria River valley a little further to the south. 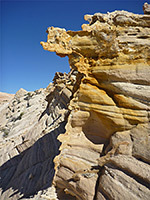 33 views of Yellow Rock; gallery, slideshow. Panorama from the top of the rock. Yellow Rock lies 31.7 miles from the north end of Cottonwood Canyon Road in Cannonville, but the shortest approach is from the south; a 14.3 mile drive from US 89, initially over grassy hills and then down into the Paria River valley, along the base of low cliffs for a few miles and over a saddle into the adjacent valley of Cottonwood Creek, which is bordered by the Coxcomb, a jagged ridge of upturned strata. Parking for the hike is on the east side of the road at the junction with a less traveled route (Brigham Plains Road) that climbs over the Coxcomb and crosses the high plateau beyond. Cottonwood Canyon Road can be rather rough at some times of year and is completely impassable after rainfall, but in dry conditions the route is usually fine for all vehicles. Other nearby trailheads, both with BLM notices (unlike Yellow Rock), are Hackberry Canyon 0.2 miles north and the Paria Box 2.5 miles south. There are many good places for free camping in the vicinity. 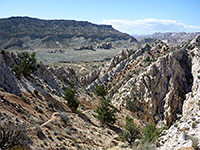 The valley of Cottonwood Creek is bordered to the west by a line of steep white cliffs, but a small side canyon immediately west of the parking area provides a route to the top of the escarpment; Yellow Rock rises up just beyond, mostly out-of-sight of the road but visible a little way south from the saddle between the Paria and Cottonwood drainages. 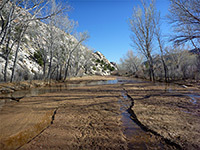 The hiking route to the rock is west, through bushes and across Cottonwood Creek, which may be dry in the summer but for most of the year is a very shallow wash, flowing gently along a wide sandy corridor lined by cottonwood trees. Once at the mouth of the little ravine, a distinct path appears, ascending rather steeply up the north side of the ravine, around the head of a small valley and out to flat ground on the rim of the cliffs, where Yellow Rock appears directly ahead. The trail, partly cairned, crosses open, lightly vegetated terrain of sand dunes and slickrock to the south side of the dome, from where the summit is a short distance further. The path continues, less used, due west another 1.5 miles to a junction with the Paria Box Trail. The summit of Yellow Rock is flat, and elongated, though the actual highpoint is towards the west. 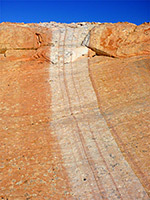 The northwest slopes seem to be more uneven and show less color variation; the best area is to the southwest, where the sandstone is smoother, colored contrasting shades of white, red and yellow, crossed by complex, swirling patterns of darker or lighter colors. These cut across the surface texture, which is thin-layered and angled, eroded into narrow, parallel ridges, best viewed early or late in the day when shadows enhance the appearance. Other parts of the rock surface are quite flat though may be cracked into neat polygonal shapes. The summit is the highest point for some distance and has spectacular views in all directions, over mountains, canyons, plateaus and ridges - west across the Paria River, north over Hackberry Canyon to other peaks including Castle Rock, and east over the Coxcomb. Most of the surroundings are similarly colorful, but less distinctive as the rocks are jagged and partly vegetated. Yellow Rock is quite extensive, half a mile across, but it is not necessarily easy to find a good perspective for photography, as much of the surface looks the same, especially from a distance. 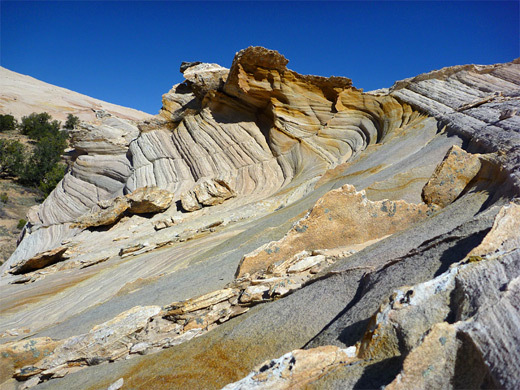 The northeast side of the dome, while being generally less colorful - whitish rather than yellow - also has some good patterns, where the slickrock begins to slope down towards Hackberry Canyon. Other photogenic features include mottled patterns of distinct red spots in yellowish sandstone, sometimes ringed by light purple and gold. The low valley in front of the rock to the southeast, just north of the trail, has some delicate eroded formations like jagged fins and wavelike bowls.